VANCOUVER, BC, October 17, 2011. Mirasol Resources Ltd. (TSX-V: MRZ, Frankfurt: M8R) is pleased to announce that a major diamond drilling program of over 90 holes and 12,000 metres of drilling has commenced at the Joaquin Silver Project in Santa Cruz, Argentina, a joint venture with Coeur d’Alene Mines (“Coeur”). 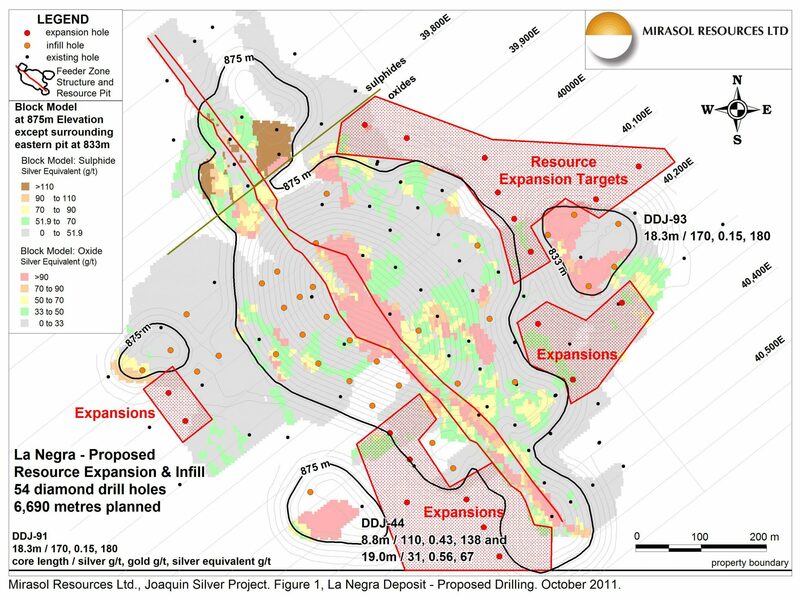 An initial estimated resource for the Joaquin Silver Project comprises 19.6 million ounces of silver in the Indicated category and 47.9 million ounces of silver in the Inferred category, as was previously announced by Mirasol (news release May 9, 2011 and Appendix A). The upcoming Joaquin drill program will centre on the La Negra silver-gold and La Morocha silver deposits, and is designed to expand and infill the published resources (Table 1). 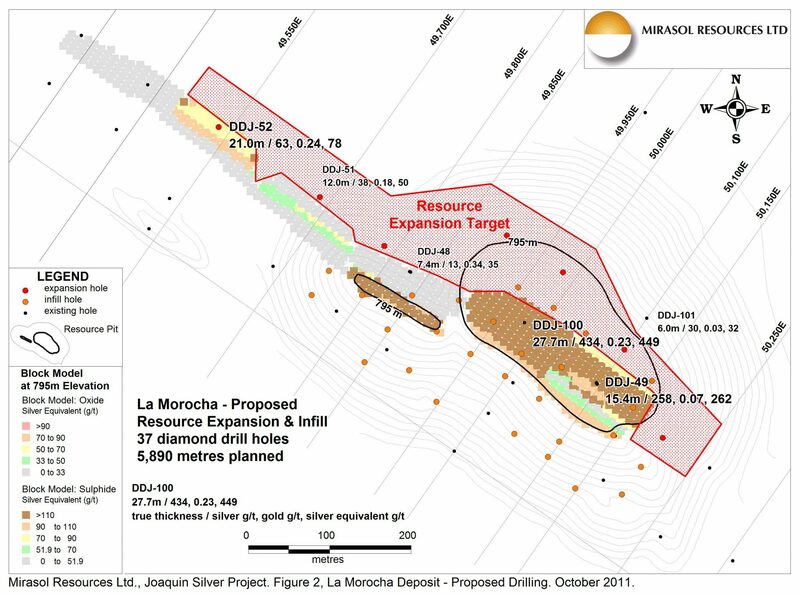 Expansion drilling will target to deepen the La Morocha shoot below its currently drilled depth of 140 metres (Figure 1), and expand the near surface oxide silver-gold mineralization at La Negra, which is open to the east and west (Figure 2). In addition, Coeur has confirmed that it plans to expand regional exploration of new targets, focused on precious metal discoveries elsewhere on the property. Coeur operates the Joaquin project and holds a vested 51% interest in the project. Coeur has recently elected to proceed to increase its equity to 61% by funding all expenditures through to the delivery of a full feasibility study. During the recent Coeur d’Alene Mines quarterly webcast, Don Birak, Senior Vice President of Exploration stated, “The Joaquin property is twice the size of our Palmarejo property. We only have really explored a small part of this large 24,000 hectare property and we look forward to new efforts on both the feasibility and exploration fronts”. Mirasol Resources Ltd. is a prospect generation exploration company focused on the discovery and development of new, high-potential precious metals deposits in the Americas. Mirasol currently holds 100% of the rights of twenty exploration prospects, including eight advanced exploration stage precious metals properties located in Santa Cruz Province of southern Argentina. These include the recently discovered Virginia Silver Project, where near-surface, oxidized mineralization is being outlined by shallow diamond drilling. The company operates subsidiary companies in Argentina and Chile, holds the strategic Rubi copper-gold porphyry property in Chile, and is engaged in generative exploration in prospective regions elsewhere in the Americas. Paul G. Lhotka, Ph.D., Principal Geologist for Mirasol, is the Qualified Person under NI 43-101 who has approved the technical content of this news release. Effective April, 2010. Metal prices used were US$20 /oz Ag and US$1,300/ oz Au. Oxide mineral resources estimated using a cutoff grade of 33 g/t Ag Eq. (silver equivalent), and sulphide mineral resources using a cutoff of 51.9 g/t Ag Eq. within Whittle(r) pit design. Ag Eq (silver equivalent) = Ag grade in grams per tonne + Au grade in grams per tonne x 65. Mineral resources estimated by the consulting firm of NCL Ingeniería y Construcción Ltda. in Santiago, Chile.